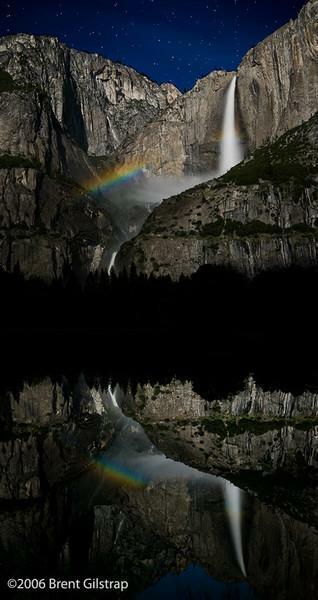 "Moonbow and Reflection at Yosemite Falls"
Wow, this is a great shot of the falls. Most interesting shots of this are when the weather is interesting but you've done it with no weather. Great! Your photos of Yosemite are amazing...some of the most beautiful I've seen. You have captured God at work. Thank you for sharing these photos. Thank you all for your kind comments regarding the Moonbow and Reflection image. "Chasing moonbows goes high tech" is the title of an article in today's Houston Chronicle (5/26/07)featuring your excellent composition. It appears from the comments entered thus far many individuals would like to purchase a copy of the print. Can you accommodate us? I have a perfect place in my home for display. ---Thank-you, Steve D.
Thank you for the camera settings, Brent! I can't believe the LATimes doesn't feel that info was important or relevant with the photo they printed in today's article. Just extraordinary; your eye is absolutely unerring. Saw your moonbow story in today's LATimes. I get moonbows for a few days each month in my bedroom, thru a window over my bed that has a uniquely-shaped prism hanging in the window. When a 1st qtr-waxing gibbous moon is in the NW sky just at the right angle, the moonlight hits the prism, and I get golfball-sized light blue dancing dots all over my room in the dark, like a disco ball. I have several mirrors in the room, which multiply the effect. Noone believes me when I talk about "moonbows", this is the first I have read of them elsewhere! My blue moonbow dots only last about 20 minutes, then the moon moves behind a roof and they're gone until the next month. I have a formula for predicting exactly the date and time of them, clear skies permitting.